Settlers didn't want bison close to their settlements so the buffalo were pushed out towards the north and the west in Saskatchewan and Alberta. 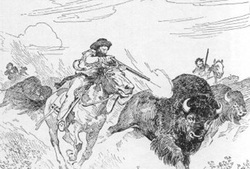 the Metis followed the buffalo migration. the Metis ate lots of pemmican and Bemit, it was a staple in their diet. After a while the buffalo hunt reduced dramatically. View Buffalo buffalo Buffalo buffalo buffalo buffalo Buffalo buffalo and over 3,000,000 other topics on Qwiki.